It’s true. Every gal needs pom poms in her life. They’re cute, they’re fun and the name itself is darn fun to say. Pom pom. When I first started knitting, I hated pom poms. I didn’t understand the point of having a tuft of yarn to top a hat. But after looking at knitted pieces and patterns over the past couple years, the pom pom makes complete sense to me. It’s the finishing touch. And I love them best on ear-flap hats, right on the end of the I-cord that ties around your neck. I finished another hat a couple weeks ago. 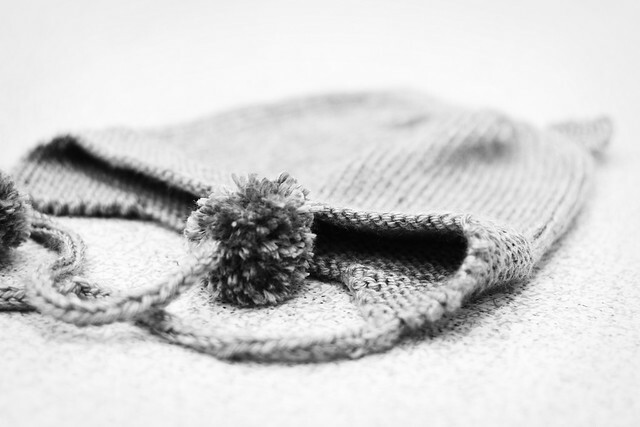 A kid-sized hat, with ear-flaps, pom poms and two little triangles on top – it was a kitty hat. The hat itself is cute. But the pom poms are my favorite part. Fluffy, soft, perfect to tug on. They make the hat, people. Susan - Is this the hat for Miss M? I bet she *loves* it. Brooke - For Kenna. I figured since I made the little guys in the office fun hats, the little gal deserved some too. Fluffy - I love wool pom hats. A wool hat without a big fluffy pom is not a real wool hat.